The experienced collector will immediately recognize the sculpted form of shoe and sole as representative of the best level of custom craftsmanship. 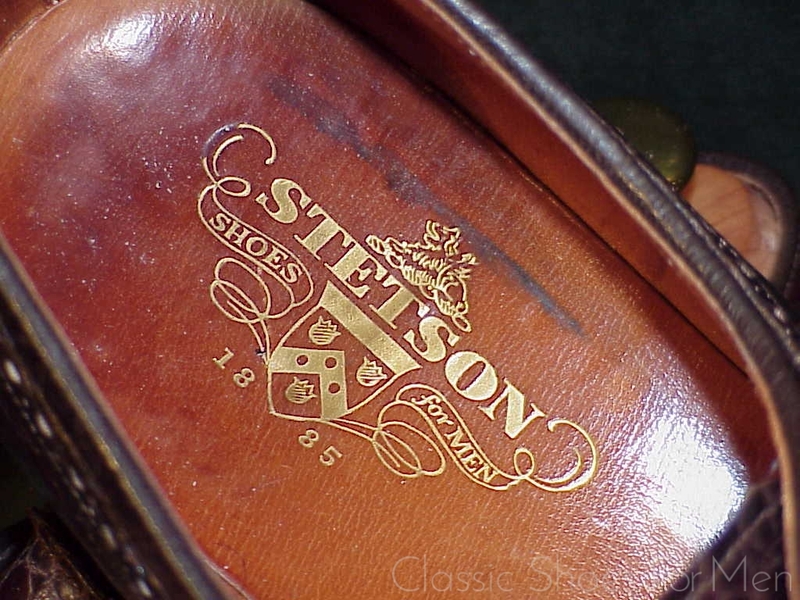 Not one pair of the avalanche of Italian or Spanish Alligator and lizard shoes, not even at fantastic prices, the best names, Santoni, Moreschi, Ferragamo, can compare to this masterpiece by this great bygone American shoemaker, The Stetson Shoe Co. who operated in Weymouth MA from 1936 to1973. 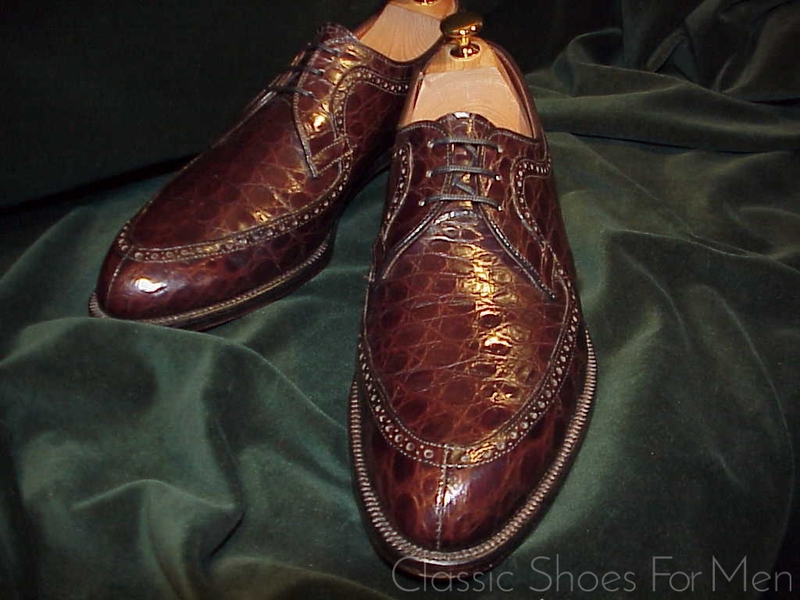 No modern shoe compares in construction, workmanship, in the meticulous matching of skins, the dramatic lasting or stylish cut. 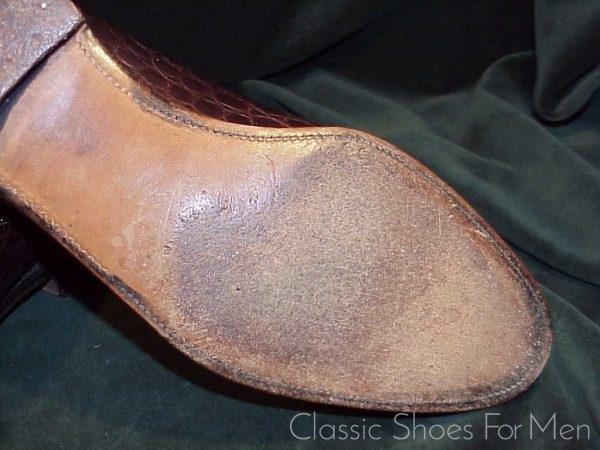 The soles are formed around a steel shank as in the finest bootmaking. 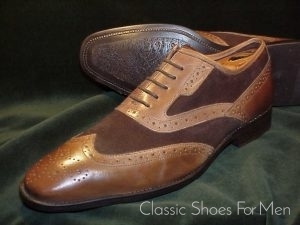 The narrow waist and dramatic angular flaring of the sole (spade sole) are charactestic of pre-war hand made shoes. . The generous chiseled toe are closer perhaps to bespoke John Lobbs before the divorce but finally they are an American phenomenon, a style shared only be the great American specialists in exotic leathers, French Shriner, Footjoy, Stetson, and Florsheim. In short, we have here a rarity in terms of number produced, numbers survived and in terms of its individualistic (and very pleasing) design. 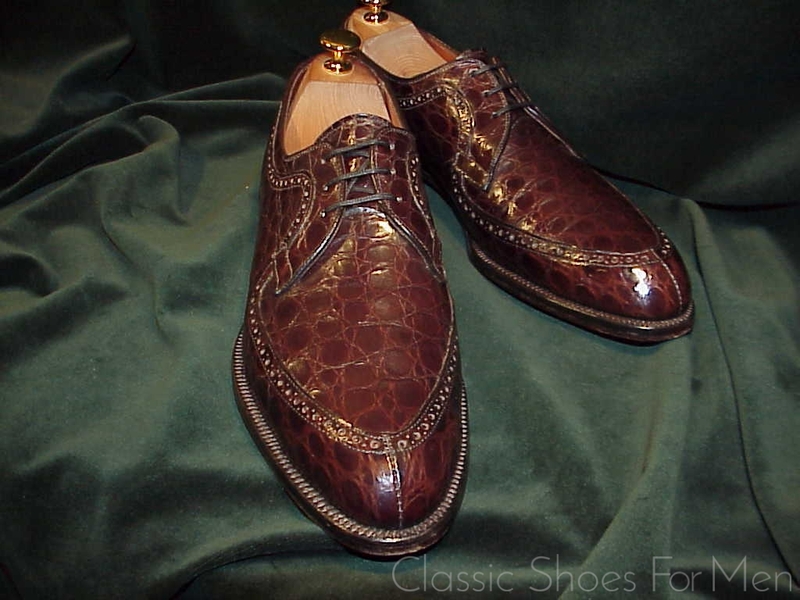 Needless to say the Alligator skins are of the finest quality, taken from unblemished farm raised animals (animals in the wild typically have too much damage and scaring from their more difficult existence), perfectly matched between shoes and artfully chosen to adorn the plain front and thrust of the chisel-toe. All edges are finished with ultra-fine piping. 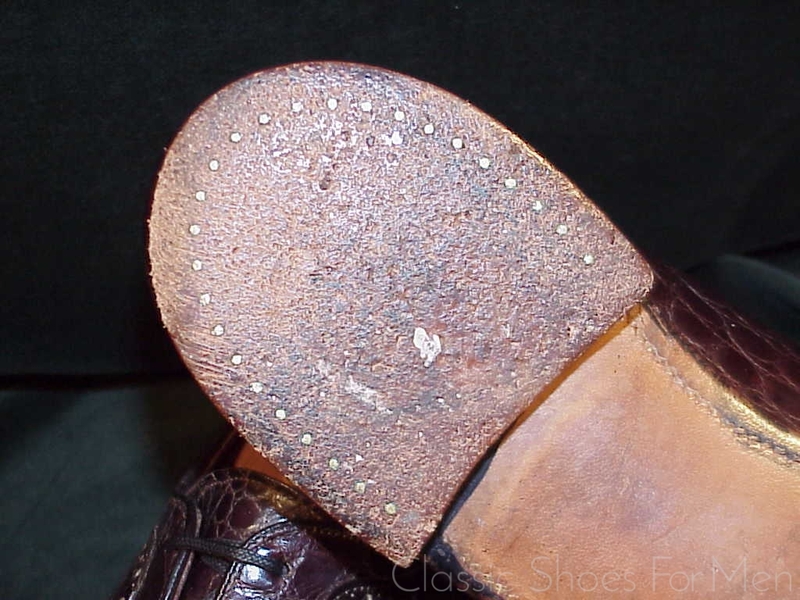 The stacked and layered heel is nailed in the characteristic fashion of a custom shoe. Perhaps only a half dozen shoemakers in the world today are capable of producing a Alligator shoe, or any shoe, of this uncompromising quality, at any price. 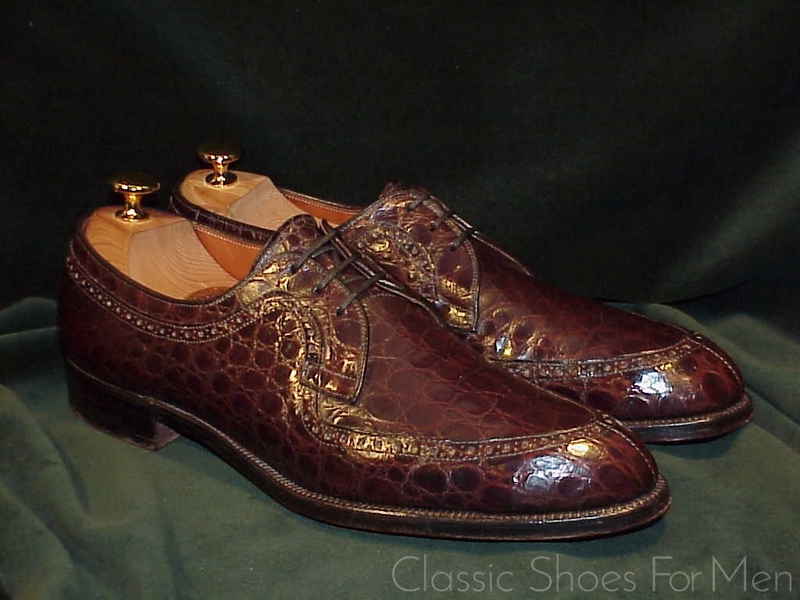 This particular shoe, while it can be copied by a gifted craftsman, cannot be duplicated in its authenticity and historical significance. It is one of very few remaining in this near new condition. 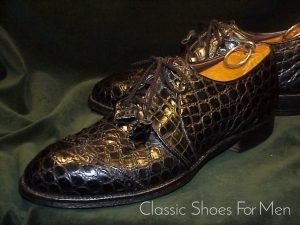 Compare this to good ready made Alligator shoes in the 2-3000 range and custom made shoes in the 4-6000 range. 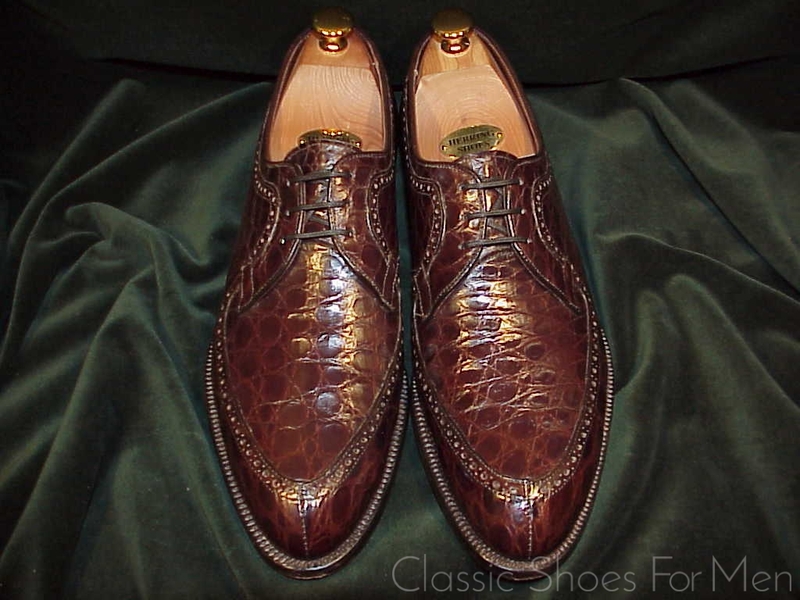 Again, this vintage Stetson 3-Eyelet, Split-Toe, Norwegian, a “Custom Order” shoe (size is hand written inside) is one of the most elegant and certainly among the most luxurious of all Alligator shoes made in the last decade of this great firm’s prominence before its falling victim to the flood of cheap imports that was the death nell to the traditional American shoemaking industry in the 1970 and 1980. 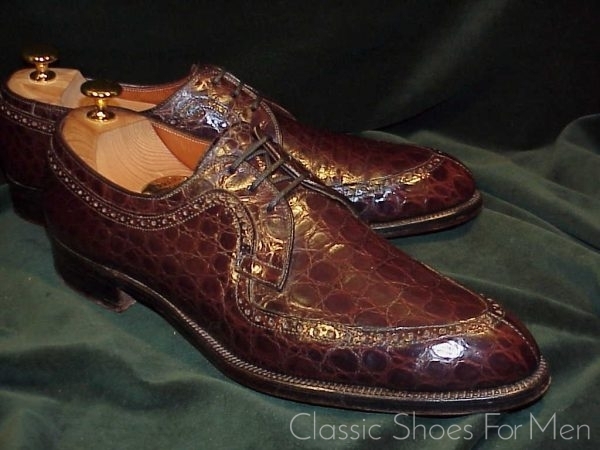 This is among the finest shoes ever to be made in America. 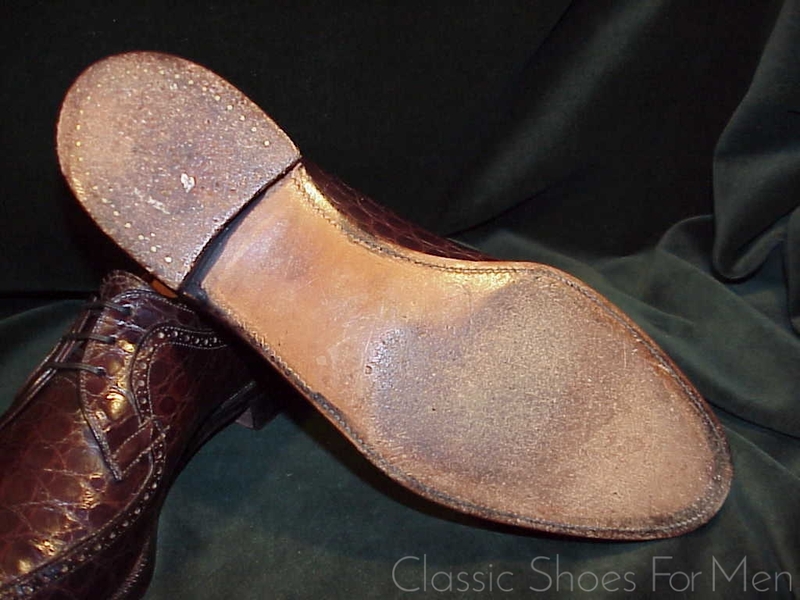 The size: 10B(US), 9C(UK), 43-43.4B (European), for the NARROW width foot. Overall condition: Uppers: Without exception excellent; flawless, the skins and linings supple as new. Interior: Perfectly clean with the no detectable wear to inner-sole. Bottoms: Soles: first trivial wear. Heel:first trivial wear. Der erfahrene Sammler unter Ihnen wird sofort die geschliffene Form des Schuhes und der Sohle als einen Repräsentanten hochwertigster Massanfertigung ausmachen können. 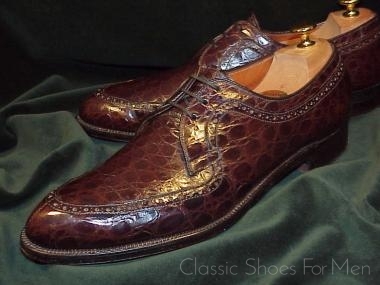 Auch nicht EIN Paar aus der Flut der italienischen und spanischen Alligator-Schuhe und Lizard-Schuhe kann – nicht einmal zu besten Preisen grosser Namen wie Santoni, Moreschi, Ferragamo – den Vergleich mit diesem grossartigen einstmaligen Schuhmacher aufnehmen, oder gar standhalten: Machart, Qualität, feinste und genauestes Abstimmung der Lederarten, der dramatische Leisten, die traditionelle Fertigung um einen Stahlschaft herum…all dies ist konkurrenzlos unter den renommierten Stiefel-Herstellern und weltweit einmalig. Die schmale Taille und die dramatische Wölbung der Sohle erinnern an Edward Green’s moderne massgefertigte Modelle, obwohl sicherlich noch radikaler in der Form. Die grosszügig zisellierte Schuhspitze ist einer Massanfertigung von John Lobb durchaus ähnlich (vor der Trennung! ), doch letztlich sind sie ein amerikanisches Phänomen, ein Stil, den nur die grossen amerikanischen Spezialisten für exotische Leder pflegen, wie etwa die Firmen French Shriner, Footjoy, Stetson und Florsheim. In Kürze; eine Rarität sowohl was die existierende Anzahl als auch die Individualität des (sehr aparten!) Designs betrifft – von der hervorragendsten Qualität des Alligator-Leders ganz zu schweigen. Diese Leder stammen von makellosen, auf Farmen gezüchteten Tieren (das Leder von Tieren auf freier Wildbahn zeigt auf Grund des Ueberlebenskampfes wesentlich mehr Spuren und Beschädigungen). Beide Schuhe haben eine identische regelmässige Musterung, kunstvoll ausgewählt, um die glatte Front und den „Chisel-Toe“ zu verzieren. Alle Ränder sind mit wunderbarem edlem „Piping“ eingefasst. Der mehrmals beschichtete Absatz ist in der charakteristischen Art einer Massanfertigung genagelt. Vielleicht nur noch ein halbes Dutzend Schuhmacher weltweit sind in der Lage einen Alligator-Schuh (oder jeden anderen Schuh) in derartig kompromissloser Qualität herzustellen. Dieser spezielle Schuh -obwohl er von einem grossartigen Schuhmacher durchaus kopiert werden könnte -kann in seiner Authentizität und in seiner historischen Bedeutung letztendlich nicht wiedererschaffen werden. Er ist einer der wenigen Überbleibsel in nahezu neuem Zustand; vergleichbar durchaus mit heutigen Konfektions-Schuhen zwischen 2-3000 und mit Massanfertigungen, die in die Tausende gehen können. Dies ist unbenommen einer der elegantesten – und ganz gewiss – luxurösesten Alligators unter den “antiken” Stetson; 3-Oesen, Split Toe, Norweger. Eine Massanfertigung in den letzten Blüte-Jahren der Firma hergestellt, bevor sie ein Opfer der Flut von billiger Importware wurde, die in den 70er und 80ern zum Sargnagel der traditionellen amerikanischen Schuh-Fabrikation wurde. 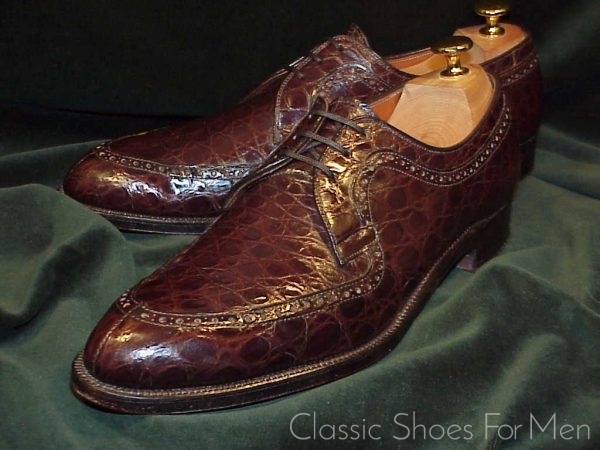 Dieser Schuh ist einer der feinsten Schuhe, die in den USA hergestellt wurden. Die Grösse: 10B(US), 9C(UK), europäische 44-43.5B, für den SCHLANKEN Fuß. Der Oberschuh: exzellent, wie neu. Das Leder und die Nähte sind geschmeidig. Innenschuh: Perfekt sauber und keine Abnutzung an der Innensohle. 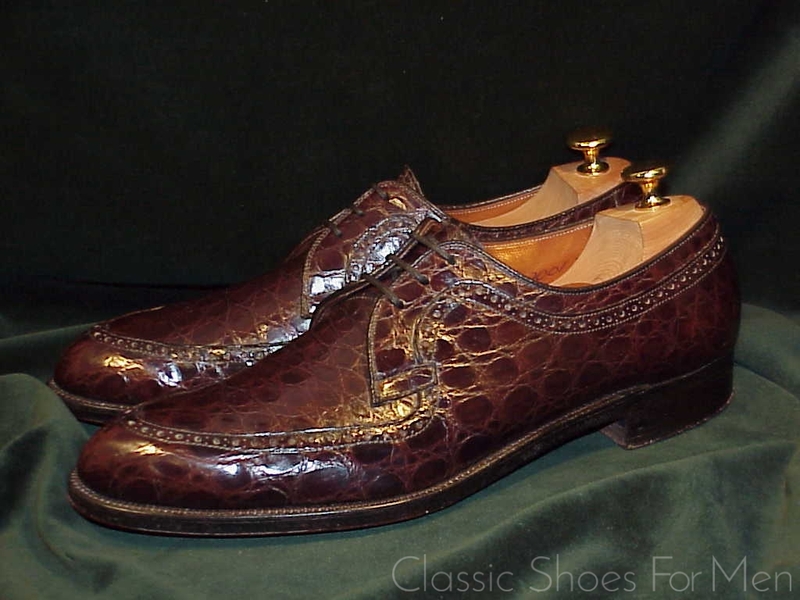 A vendre, une paire des classiques gentilshommes, le Derby Demi-Chasse, dit « Norvégien » en le meilleur Cayman Alligator, de l’ancienne grande marque américaine, la cordonnerie Stetson. Ces chaussures ont été faites à la main dans leur atelier et peuvent concourez avec n’importe quelles chaussures américaines ou anglaises. Un seul coup d’oie sur la semelle suffit pour faire évident la différence énorme. Sans exagérez, nous avons devant nous un exemple de l’art de cordonnier le plus cultivé, une chaussure pour délie avec ces détailles raffinés. 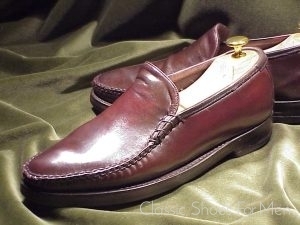 Avec « Goodyear Welt », cousue à la main, et doublure de cuir extra souple. Elle représente le summum d’une veille tradition en perdition. Pas seulement introuvables en France, mais aussi bien en Amérique ; elles ne sont plus fabriques depuis au moins 40 ans. Cette paire dérive de l’année 60. Elles sont plus rares que les chaussures des firmes anglaise les plus fameux or le meilleurs des cordonneries en France et simplement plus belles que n’emport quelle version moderne a n’emport quels prix. Ce pair est la pointure 10B Américaine, 9C Anglais, soit 43-43.5B l’équivalence Française. Evidement vous pouvez m’enquêter sur quelle que chose semblable en Alligator en votre propre taille. Paiement par virement bancaire, s.v.p.. Frais de poste : 14,20 € en France; pour le reste d’Europe contacter moi.